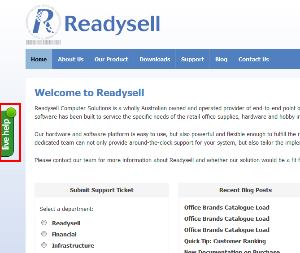 In addition to our phone and ticket based support, Readysell is now trialling a live chat support service.Â This new service is best suited to less involved support requests, but you are welcome to use it at any time – if we can’t solve your problem on the spot we will open up a ticket to track your issue through to completion. To use the new live chat, just visit our web site and click the “Live Help” button on the left side of the screen. A chat window will pop up and you’ll be connected to a member of our support team in a few seconds. We are interested in your feedback and whether or not you find this new service beneficial. Send us an email or comment on our blog to let us know about your experience.